A new athletics facility for the country's budding Olympic medallists has been officially opened. Olympic Minister Tessa Jowell unveiled the new Lee Valley Athletics Centre in north London on Tuesday. The site will improve training opportunities in the run-up to the 2012 Games and provide a new home for Enfield and Haringey Athletics Club. 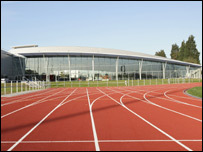 The centre is said to be the largest indoor and outdoor athletics facility serving London and the South East. It houses the only indoor 200m six lane track in the South of England and also comprises permanent seating for 500 spectators and cutting edge sports science and physiotherapy suites. The 2012 Olympic Games will be centred in the Lee Valley area. Ms Jowell said: "The Lee Valley Athletics Centre is a fantastic new facility. "This will be a hub of training and support for those talented athletes aspiring for the podiums of 2008 and 2012. And it will also inspire people of all ages, recreational and community users too, to get out and take part in sport." The Centre has been funded by £4m from the Department for Culture, Media and Sport's Capital Modernisation Fund, £7m from Sport England (via the National Lottery), and £5m from Lee Valley Regional Park Authority. Seb Coe, Chairman of London 2012, who ran for Haringey Athletics Club in the 1980s, said: "The Lee Valley Athletics Centre brings cutting edge facilities within reach of millions of Londoners and people in the South East. "There has never been a better time for people of all abilities to give athletics a try."